Ok, so now you have heard of weightlifting shoes (let's call them WLS) and think if you should use them or not? Read our guide here about some of their benefits that may suit your need. What do weightlifting shoes do? Unlike regular shoes, WLS, as their names suggest, are made for weightlifting or heavy training. Their design is a bit different and some people just don’t really like the look. On the other hand, there are people that prefer to squat barefoot instead of wearing them. 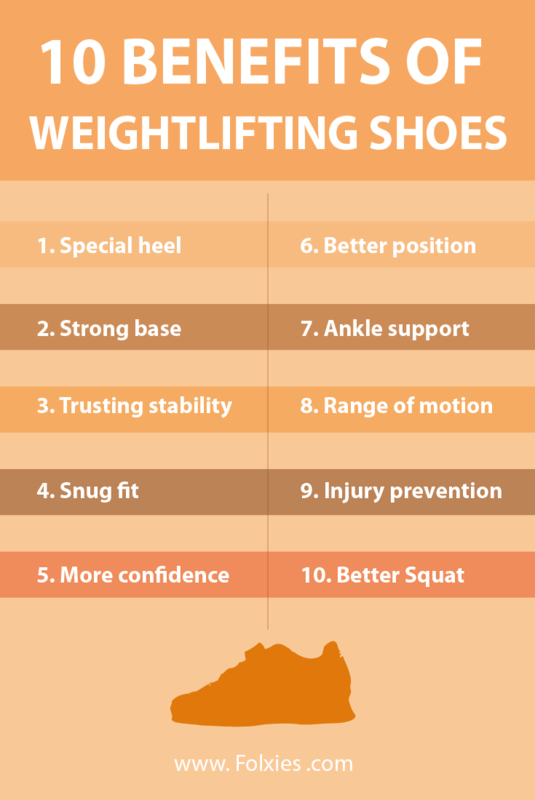 In fact, weightlifting shoes have a lot of benefits more than you can expect. You can maximize your training results as well as prevent the possibility of injury while lifting weights or heavy objects. In case you are addicted to squatting, WLS can provide the total balance that you need to perform better. Let’s find out more below. They are designed to have raised heels. The elevated heel will help you move or lift more weights by taking advantage of the force that your body produce and turn that forge to the strength that you need all the way from the ground up (which is not possible if you have weak feet or poor balance position) and help you lift those bars and weights upwards. Shoes with soft soles will just waste the forge that’s you are trying to generate to lift that heavy bar. WLS with their firm sole will stabilize your whole body as well as giving the desirable ankle degree for a lower, deeper squat. These raised heel shoes are more stable than other shoes that are not designed for weightlifting purpose. They hold your feet firmly and help distribute the resistance stability proportionately so that you can pull your strength better. Aside from raised heel, WLS come with strapping and laces support that make our feet feel they are comfortable in every direction. Wearing those shoes gives you the feeling that you are protected and supported with better balance to lift more weights, thus turn out greater results. A hard plastic/wooden flat sole, higher heel and snug fit support are the features that your weightlifting shoes will have to align your position and postures the right way. Your ankle will thank you for the extra aid they get from WLS. That means you place less stress on your ankle and protect them at the same time. Not only does your ankle get the support that it needs those shoes also help alter the maximum range of movement that your ankle joint can perform. Moreover, the tarsal straps will create a flexible hip activation for a more effective workout. Weightlifting shoes help align your feet, ankle, lumbar spine and pelvis, thus protect your possibility of being injured during your training session. You can use them to squat even though there are people who think it is better to squat barefoot. I won’t argue as long as it is up to people choices but I believe those shoes can give you the balance and stability to squat more, with all those benefits that mentioned above. The latest of model of weightlifting shoes of 2018 which we think most affordable is Adidas Powerlift 3. For older version you can consider the Warrior - Wei-Rui from MaxBarbell. Sometimes we are lucky to find good shoes from famous brands like Nike, Adidas, Reebok on sale/clearance. You can join discussion on Reddit to find out which sitea are currently having a sale or bookmark this site, we will update for you. The best latest WLS of 2018 we come across is Nike Metcon 3, a good pair of shoes come from a famous brand at a reasonable price. If you have money to spend consider the Reebok Legacy Lifter, which is also the latest release in 2017. The difference lies in the soles. Powerlifting shoes have flat, softer soles. Some people believe that they are less stable than WLS. Down to conclusion, if you’re still in doubt whether you should invest in a pair of weightlifting shoes or not, why not give them a try? Weightlifting shoes are not really expensive; you can get a good pair with reasonable price and sometimes you will be lucky enough to buy high quality weightlifting shoes with discount (on Black Friday/Cyber Monday sale period, for example). Considering how they can prevent your risk of injury, I don’t think that they are just a waste of money as long as you treat them with care, those will be with you for a very long time. Please share this article if you find it helpful. We appreciate your kindness and will work hard to provide more reviews and guides.